One of the adjunctive treatments used at Worcester Chiropractic Clinic is sports taping. Your chiropractor will discuss with you whether taping is likely to be useful for you following examination. Sometimes called Kinesio Taping or K-Taping, sports taping refers to the application of elasticated fabric to help support muscles or joints. Taping can be used to off-load joints and muscle tissue whilst recovering from injury, or can be used to minimise the injury risk of carrying out strenuous activity. 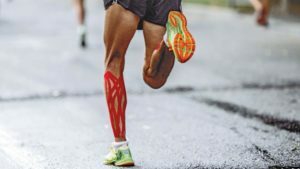 More and more often athletes are turning to sports taping as a way of allowing them to perform without injury or to play through a niggle, but taping is also useful for aiding recovery of day-to-day injuries amongst non-athletic persons. Sports taping as a concept was invented by a Japanese chiropractor, Dr Kenzo Kase, who coined the term Kinesio Taping. There are a variety of ways to apply Kinesio Tape, each with a slightly different intended effect. Joint stabilisation is useful where athletic activity or day to day demand place excessive load on a joint. Taping a joint limits its mobility to within normal limits, helping prevent injury whilst allowing you to continue normal activity. This is also useful in certain cases where a joint has been badly sprained. When stabilising a joint, zinc oxide tape is best used as this is a much more robust tape than other products. Tape is best used as a temporary support whilst a rehabilitation regime is followed, designed to strengthen the muscles surrounding the affected joint. More elasticated tapes, such as Kinesio Tape, Rock Tape and others, are less useful for stabilising joints. However, tapes with some stretch are used for taking load off of tendons and muscles. Having a degree of elasticity similar to natural tissue, sports tape applied along the course of a muscle takes some of the strain that muscle would experience, but without limiting movement. Perhaps one of the most dramatic uses of Kinesio Tape is in reducing bruising and swelling by aiding lymphatic drainage. Tape subtly lifts skin away from underlying tissues allowing fluid to drain away more efficiently. This is best visualised. Kinesio Tape can help reduce bruising. 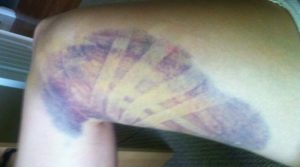 The pale stripes indicate where tape was placed over the bruise. There is also some research to suggest that Kinesio Tape applied to a muscle improves your brain’s awareness of that muscle, making it easier for you to use it. This is extremely useful in cases where an injury is caused by an underactive muscle and helps with retraining proper movement patterns. Crucially, none of the effects of Kinesio Tape are particularly useful without concurrent rehabilitation to address underlying causes of joint/muscle dysfunction. No, the colours of sports tapes and Kinesio Tapes are just for aesthetics only. How long can I wear tape for? Most sports tapes are water resistant and are designed to be worn for several days or even a week at a time. Can I apply sports tape myself? In some cases, yes. Some applications are slightly complex, requiring a clinician’s help, but other applications are very straightforward once you’ve been shown how. Do you charge extra for sports taping? No, we feel that adjunctive treatments such as sports taping and acupuncture are all part of the service when you see a chiropractor, so these services are all included in our normal treatment fee. Do you sell sports tape? Not at present. We’re unable to source tape at a lower price than you might find online, so we recommend self-purchase if you want to apply your own sports tape. I have a latex allergy, can I use sports tape? This depends on the brand, but in most cases yes. Check with your clinician first. Is the brand of tape important? Not especially. Some tapes stick a little better than others, some look fancier, but in general they all do similar things in similar ways. If you think you would benefit from sports taping, please get in touch.